In what turned out to be an extraordinarily busy week I found an opportunity to churn out 2 demonstrations while I worked with online students. The first is a drawing of an incidental character I came up with when first developing Crash Bandicoot way back in 1995 during the Willy the Wombat days. I did this very quickly in a matter of a few minutes in Photoshop as time was running out during the session. The second one below was started during the class and I found time to continue working on it this evening. What began as a very basic and simple approach to coloring turned out to get more involved than I originally planned but it was fun none the less. 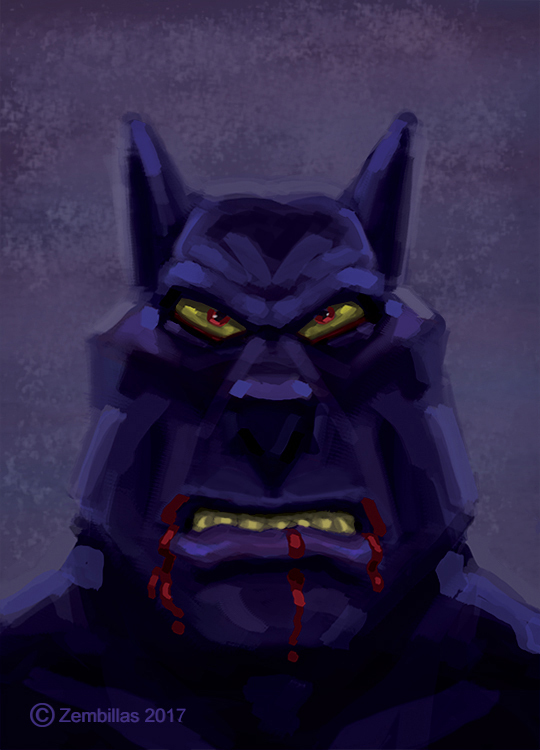 My student asked for something kind of dark and grim and menacing so I fell upon a werewolf type of character. It's been a while since I came up with one. Enjoyed myself after the madness of this past week. Gets crazy sometimes but it's all good and everyone's happy it seems. I love the werewolf character, he looks sinister and feral. Does the lizard ever got a name? or is his name actually Runner Lizard? Also I don't know if you've seen any of the footage for the new Crash Bandicoot HD collection, if so what are your thought on it? I like the effort but I think the artists decided to add unnecessary details just for the sake of making it look HD. I think Crash's artstyle should be more angular and simple, just like your art. Adding scales on the Komodo Bros or furr on mammals just doesn't look right to me. Hey there Gabriele. 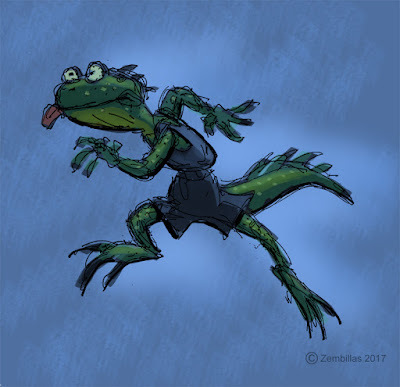 I just call him Running Lizard. They made him a normal lizard in the game. Who can say what he would've been like if they went the other way with him. As for the video you posted the new Crash HD game game looks extremely well done. They did a terrific job. Crash looks great and I don't mind the texture and additional detail. Today's production software is very powerful and way beyond where things were 20 years ago. You want to make the most of what it can offer artists. And those artists want to push it to its maximum effectiveness. No problem on my part with the direction they took. That said I do appreciate the design approach on the original game. That too maxed out the technology of the time. They made the best of what they had to use. Hey Charles like the recolour of an old Crash Bandicoot concept art character and the werewolf character. i was wondering about Crash Bandicoot charterer Tiny Tiger. Looking at his original bio for the charterer. 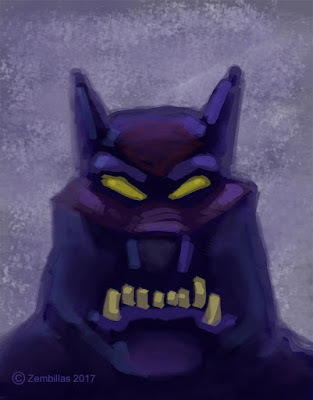 http://vignette4.wikia.nocookie.net/crashban/images/2/28/Tiny_Bio_Concept.png/revision/latest?cb=20151119163659 im guessing this was Joe Pearson was coming up the concept for the character he wanted. But Naughty Dog didn't like it because it was a little to violent for the game. So they decided to give him red converse as a way to jump on Crash as new attack mode to suet the games. any way that's my thoughts. Thank you Hazman. Color on the lizard was done very quickly. Surprised myself how fast I did it. Just like the lizard. A fast runner. Turned out okay and my student enjoyed the lesson. Regarding the character of Tiny Tiger (or Tazmanian Tiger as he was originally named) that was all Joe Pearson as far as I know. The drawing you posted was a clean up / final design of Joe Pearson's concept. I don't know what was communicated between Joe and ND while they were discussing the character. I do know that Joe wrote most of the material for Willy the Wombat / Crash and that he was the primary individual behind the development of the creative content. Putting sneakers on the Tiger would be something that Joe would think of. That's a mark of his unusual and unique approach to things. Ah k thanks for clearing that up. Haha, I love that lizard character, wish we could've seen him used to his full potential in the game. And so cute with the tongue sticking out! He reminded me of a character duo I've had floating in my head for a while but not quite gotten around to draw yet. This inspired me though, so here's Flem & Iggy! Thanks for the response. As far as I saw they are being extremely faithfull to the source material, putting some of their own here and there (Like changing the creepy hands in Cortex Castle into Old Guys: https://crashynews.files.wordpress.com/2017/02/unknown-8.png?w=676&h=594). I personally always saw Crash and his world as a perfect fit for a classic Looney Tunes cartoon (my favourites cartoons of all time) and the limitations of the PS1 actually made the looks more cartoony, sharp and simple, so when I see this extremely round and detailed models I find them more appropriate for a Pixar movie, nothign wrong about it at all, but for me the classic cartoon feel is a little bit put aside for the semi-realistic details. On the other hand, I can see why they did it, like you said modern technologies let us do things that were impossible 20 years ago, so an HD Remaster must push those technologies to the limit. RubbberRabbbit2 - Flem and Iggy - I like the characters. Good design and I especially like the way you handled the placement of Iggy's tail. Nicely done! Gabriele.T92 - Crash still lends himself to a simpler more graphic and cartoony style. That can always be done. If there was a choice between the two approaches. A full CG version of Crash and a more basic graphics oriented version. And if the choice was along the lines of - we'll bring Crash back if we can adapt him to new technology as opposed to we'll keep him off the market if it's going to be the old way - what would you choose? I'd rather see Crash revived with an updated look and introduced to a new generation than spend more time not having him around. I'm happy to see him back and glad they did such an excellent job. Sure, I love this remastered version too, maybe the problem is that I compare it too much to the originals, if it was a totally new adventure I would think it's perfect. Now I just hope that this game will open up a new golden era for Crash Bandicoot, after all adapting the original games must have taught something to the devolpers, I'm sure they'll do a great job with a potential Crash 4. Look at it this way. Now they have some of the assets to develop a brand new adventure. If the game doers well and they decide to go in that direction in the future they've taken the first steps. Yeah that's what I'm hoping for: Shurely remastering this games taught them what made Crash great to begin with and we could have a proper sequel to Crash Warped. Still hope that they would contact you and Joe Pearson to help with artstyle and design, plus use the material from the bible and have brand new bible pages with more backstories and stuff, It would be amazing! Hello Gabriele. Maybe someday we'll hear from them. Meanwhile we're both still doing things that are fun for us. Life keeps moving on.